You need to sing it out sometimes. Regal Films' So It's You bloggers conference held at Imperial Palace Suites Quezon City was fun not just because of the expression "copy-paste" by Tom Rodriguez and Carla Abellana but because it once again reminded me that "Some paths are meant to cross". 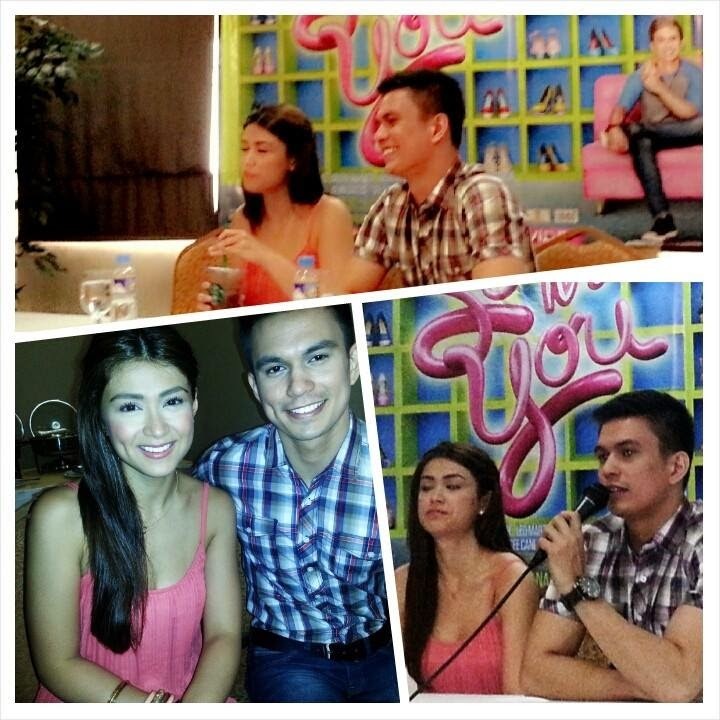 So It's You movie starring Carla Abellana and Tom Rodriguez also costars JC De Vera, Joey Marquez, Leo Martinez, Kevin Santos, Paolo Ballesteros, Bangs Garcia, Gee Canlas and Marc Justine Alvarez. Directed by Jun Lana (DGPI), Regal Film's newest romantic comedy is Carla's first try to make the audience laugh after the big attention on her role in My Husband's Lover at GMA Network. It was hard to contain laughter at Tom Rodriguez who responded to questions after Carla with "copy-paste" agreeing to the opinions of the leading lady. Ms. Carla playing Lira in So It's You was confident after seeing the movie's rushes. Tom assured the bloggers they'll feel romantic after watching the film. True enough, all of us were screaming with the Carlaholics and the Friends of Tom at the premiere held at SM Megamall Monday night. Spoiler Alert: Please do not read further if you plan to watch the movie, otherwise read at your own risk. After watching the premiere with the whole cast (courtesy of Regal Films) and the bloggers, I've come up with these 5 Reasons Why You Should Watch Regal Films' So It's You Movie on May 7, 2014: 1. You need a good laugh. Regardless of the reasons why you have stress, whether it's work or personal circumstances, So It's You Movie will surely crack the laughter out of your system and forget your own distress at least for more than an hour. The production design depicting how the family of Lira got rich because of lotto will easily make you laugh. 2. The best friend of Lira and her brother is another story. Regardless of its predictability after the discreet watching of Ms. Universe collection of Lira's brother, scenes on how the brother tries to hide his sexuality will surely entertain you. The terms of endearment in between the scenes of Jojo and L.A. were also hilarious but I believe this angle of romance added another flicker to its glitz on the screen. 3. Gee Canlas is another character to amuse you. Her role playing the bride of Tonio (JC De Vera) reminded me of "When Harry Met Sally" getting looney on shoes made by Gorio (Tom Rodriguez). It's unique, distinct and really entertaining to be so fetish on shoes with lines, "I'm sorry, I treat my shoes like my groom on our first night" (something like that). The audience kept laughing until the camera pans to the next scene. 4. The punch lines were effective. Naming your cars and seeing the personality of the car will give you ideas. Watch how Gorio (Tom Rodriguez) places interesting things on his car (Ashley) and the details of Lira's car reflecting what she loved the most. I'm also entertained at Lira's flower hair pins and earrings. The Jolina style of Lira (Carla Abellana) will remind you of previous romcom movies but Direk Jun Lana was able to show original funny scenes using Lira's earrings in some scenes. 5. Instagram has its benefits in relationships. Lira (Carla Abellana) and Bangs Garcia (as mom of Gorio's deaf son) post on Instagram religiously and the captions brought laughter on the screen. I loved the way Direk Jun Lana depicted the reality of Filipinos today doing all sorts of efforts and stunts just to post a beautiful photo on Instagram. As a blogger, the movie reminded me how important it is for more Pinoys to watch the film and realize social media responsibility. It should teach the public majority to be like Gorio (truthful) and never pretentious. Learn from Gorio (Tom Rodriguez)'s example, be honest all the time and say your feelings in person. From the bloggers conference and the movie, I've learned that somehow there are only two types of people in the world, one who's very certain and definitely planned every goal in vivid details like Gorio in the movie (more like Carla in real life, opposite of Tom's personality being adventurous) and Lira being clueless and passive (incomparable to the real Carla being conservative). The characters will teach you a lesson and the movie will surely give you laughter with "kilig" moments. Watch the movie to be entertained because if you are a movie critic, you'd notice more flaws than bright moments of Carla Abellana's first romantic comedy in her career. This movie is better watched by not just the gays and the broken-hearted, it should be watched by those who have lost faith in love. Believe in serendipity and watch the magic happen in your own life. What's your sulking moment song? So It's You is now showing at all cinemas nationwide. Follow the updates of So It's You Movie on Facebook at www.facebook.com/SoItsYou.RegalFilms and @RegalFilms on Twitter. Thank you Regal Films for the opportunity to learn and be amused at your film,your stars and your iconic creations!.